Burnt almonds are a traditional snack found on the streets of German cities in the holiday season. Crunchy, nutty almonds are coated in a layer of sugar and cinnamon to make this tasty treat which is dished out hot to warm up happy pedestrians. Although we're a far ways away from German Christmas Markets, these delightful almonds also make great finger food for parties certainly for say....New Years? They also make great Christmas gifts, wrapped in old fashioned paper cones and decorated with lovely ribbons. Watch out when making this one, although they have simple ingredients, like all candy it's relatively easy to burn so keeeeeeep stirring! 1) Grease 2 cookies sheets on which you'll pour out the almonds when ready. You'll need these close to your work area as the almonds must be removed quickly from the pot once ready. 2) Take a big, thick bottomed pot, add 2 cups of sugar, water and cinnamon, heat and stir on medium until homogenous and liquidy, add almonds. 3) Keep heating and stirring quickly and wait patiently until the syrup thickens and the almonds stick. 4) Once the almonds are sticking add the vanilla and remaining sugar, remove from heat and keep stirring until almonds are coated in the crispy sugary coating, pour out onto cookie sheets. 5) Let almonds cool about one hour before eating this will allow them to cool down and for the almonds to become hard again. 6) Add water to the pot and heat on low heat to melt all the sugar off and clean the pot, this step is optional but highly recommended, unless you want to spend eternity scraping the pot! Hello there everyone! I hope that everyone had a wonderful Holiday Season/ Christmas. Although I must apologize for the late post (blame the flu!) I'm hoping I can make up for it with a few photos of Christmas joy! It was busy busy so the photos aren't the best but I promise to do better next year. It was absolutely fantastic to have most of the family home and to be able to enjoy a hearty brunch together. As with every year, we gave each other all sorts of fun, useful and strange gifts so expect some new cooking tools folks! With that being said, best wishes everyone, hope your Christmas was lovely and I'll be sure to have some new recipes up for New Years! certainly when followed by mimosas! And a few sinful munchies as a snack! And we were ready to face the gift pile! 8) Slice ganache balls in half if you think they're too big (upon reconsidering, I do it all the time), re-shape them (bumpy is still good!) and throw them in a tupperware in small bunches, a handful at a time. 9) Add cocoa to the tupperware and shake until coated, the truffles can now be tinned or boxed! Ginger has long been known as a natural remedy for nausea (and everything else under the sun if you read health food articles) the one thing I do know about it though, is that it's absolutely delicious! Used all over the place in Asia, ginger has crept in to some of our most traditional holiday recipes be it in fruitcakes, mulled wine or anything else. One particularly delicious treat (with a kick!) that's worth giving a try is crystallized ginger. If you've ever had it, you probably love it, or have at least developed some kind of Stockholm Syndrome relationship to it...if you haven't had it? You should definitely make it! Although being a bit of a pain to make, this confection is absolutely worth it and is great to put into gift baskets with an old fashioned feel! People who haven't tried it might be surprised by its deliciousness, I know I was when I first had it when I was (briefly) in Japan! Anyway, enough rambling, let's get to it! 1) Prepare a landing pad, ie a glass pyrex, plates or a cookie sheet on which you'll be able to pour lava-hot ginger directly from the pot. 3) Cut the ginger into thin slices with a knife, not necessarily paper thin but not wedge-like either, you want a good promise say 1/8 of an inch? 5) Bring the heat up to medium and cook. First the sugar will turn syrupy, then the water will begin to evaporate and finally crystals will form, stir constantly and quickly scraping the sides to prevent it from sticking, once the sugar sticks to the ginger and not to the pot and it has become dry as a bone, pour the ginger out onto its landing pad before it burns. 6) Let cool and enjoy! Consider wrapping it in bags and giving them out to make some new best friends, watch out, this stuff has kick to it! 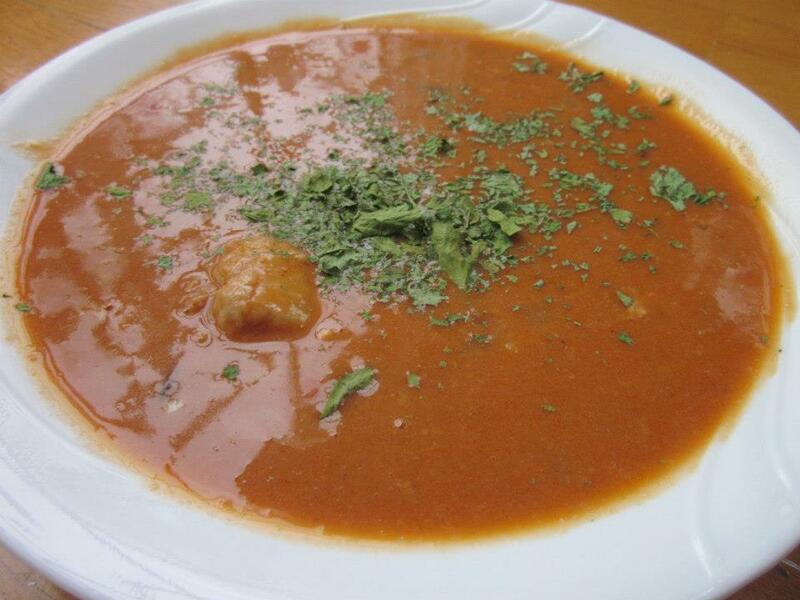 This warm and hearty soup is a strange lovechild of international cuisine. Combining the hearty, thick peanut and coconut of a traditional Brazilian soup recipe with the spiciness and blends of flavour of a Thai tom-yum soup results in this tasty soup! Easy and quick to make, it's sure to warm you up! 4) Garnish with fresh coriander and serve! This...this...it's one of THOSE recipes. You know, the recipes you make that everyone asks for? You know that dessert that people steal pieces of as soon as it's cooled to stash it in their bedrooms? Yeah this is one of those. This is my reworked take on "Abby's Famous Pecan Pie" filling recipe which won a whole wop of awards in the south combined with my mum's crust recipe. Of course, it's been reworked a tad to incorporate some Canadian-ness ie I played with sugar levels and added maple syrup (why wouldn't I!?). Why haven't I posted this earlier? Aside from the fact that I considered keeping it for a cookbook, there also my shame, the shame that I still can't make mind blowing pie crust like my mum can. So, for now....I will simply drown my sorrows in slices of pie...delicious, gooey, sweet, salty, nutty, melt in your mouth PIE. Seriously, you should make it. Like now. Also, thanks Alison for the original filling recipe! Oh the other reason I didn't post earlier? NO PICTURES! It gets eaten too fast...that's why this slice is so small, it was the last one. 5) Flour a counter, roll out your pie dough and fit it to a pie dish, this is often easiest if you roll it around your rolling pin and then unroll it onto the pie dish. This recipe is extremely easy and absolutely ready in a jiffy! It came about as just a simple way to add colour to my brunch table, surprise surprise, it was a great success! The contrast between the tang of crisp fresh berries and the smooth, velvety richness of cream gets me every time. In this case we add the bittersweet flavour of dark chocolate to the not overwhelming sweetness of perfectly ripe bananas leading to a decorative yet tasty delight! 1) Assemble whip cream by whipping all ingredients together at high speed until thick enough to hold its form, set aside in the refrigerator. 2) On low heat, melt the chocolate and dairy together, feel free to add more liquid if required, you're aiming for something thick enough to be rich and decadent but thin enough to drizzle. 3) Slit bananas lengthwise from end to end and then halve or even cut into thirds, once this is done, fracture their spines by cracking them open just enough that they remain open enough to be stuffed. 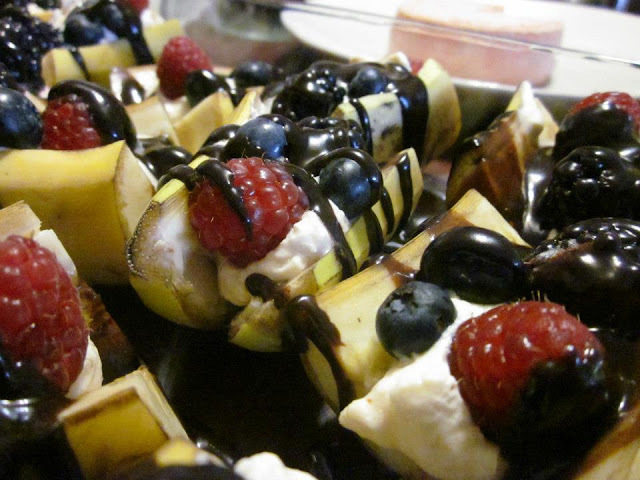 4) Stuff bananas with whipped cream, followed by berries and then drizzle with chocolate! 5) Serve this easy treat to your happy guests!